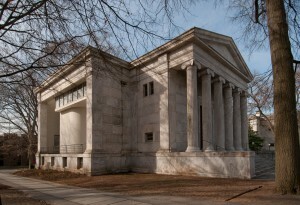 April 25, 1 pm – Tour of Louis Kahn Bath House at Ewing Senior Center and 1867 Sanctuary on Scotch Road with Michael Mills, Restoration Architect of the Bath House. Tour starts at Bath House, 999 Lower Ferry Road, Ewing Twp. THE BUILT ENVIRONMENT: DESIGN FOR LIFE exhibit includes photographs, drawings, notes and plans highlighting architecture in the mid-Jersey region — a combination of historic buildings that have been adapted for re-use, modern construction from the 1950s to 1970s, and contemporary structures built more recently. The exhibit focuses on buildings from the late 1950s to the present that demonstrate adaptive re-use, and on properties that have been designed for energy efficiency and climate. The exhibit also looks at the impact Princeton University faculty from the School of Architecture had on the central Jersey region. Lecture discussions, films about several of the architects and buildings featured, and a tour of sites highlighted in the exhibit are offered as part of the exhibit experience. The only buildings architect Jean Labatut, Director of Graduate Studies in Architecture at Princeton University, ever built in the United States are the campus buildings and chapel at Stuart Country Day School of the Sacred Heart in Princeton NJ, and yet his influence extends far beyond Princeton. 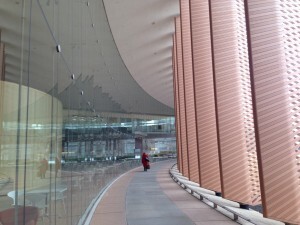 His design, featured in the exhibit, is a combination of modernist and organic forms. Today he is considered a seminal thinker, influencer and teacher of many architects including Robert Venturi. His protégé, J. Robert Hillier, served as Labatut’s designer/drafter. Hillier has gone on to create many commercial and residential buildings, locally, nationally, and internationally, and is known for building one of the most successful architecture firms in the world. 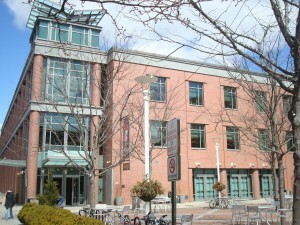 In New Jersey, Hillier worked on the Princeton Public Library, Bowen Hall at Princeton University with Michael Chimacoff, and in Trenton, the Hughes Justice complex in addition to numerous residences in central NJ. A special section of the exhibit that focuses on design for climate explores several ‘firsts.’ In the 1960s and 1970s the Oljay brothers who taught at Princeton, continued their experimentation with designing homes for climate, a first in the United States. One of the projects featured in this exhibit is the same plot of land they designed for four different climates, ranging from very warm to very cold. Douglas Kelbaugh, a Princeton University School of Architecture graduate, designed in 1970 the first example in the US of a passive solar home, still located in Princeton NJ. The house utilized a ‘Trombe wall’ and it became a well-known icon of the passive solar movement. Kelbaugh also established a community design center in Trenton and has gone on to teach, write, speak and consult on projects all over the world. 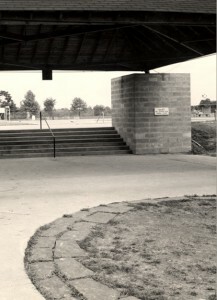 Perhaps one of the most famous structures in central NJ is the Louis Kahn bath houses in Ewing NJ. Their significance in the development of his oeuvre was pivotal and he has said it was a turning point in his career and architectural thinking. Restoration of the bath houses by local architect Michael Mills is also featured. In older communities like Trenton and its inner ring of suburbs, adaptive re-use has been utilized to preserve historic structures and bring new uses to them. The architectural firm of Clarke Caton Hintz has played a key role in adapting the Masonic Temple, Golden Swan building and Cracker Factory in Trenton and the Lambertville House in Lambertville among many others. The 1867 Sanctuary, a former church, is also being adapted for re-use lead by Preservation NJ, Partners for Sacred Spaces and architect Michael Mills. There are so many outstanding projects to highlight that it was hard to whittle down a selection, however, the role Princeton University played and plays in shaping our local landscape cannot be underestimated. Robert Geddes, the first dean of Princeton’s School of Architecture, created a mostly underground addition to The Institute for Advanced Studies at Princeton, and also created housing for seniors — The Architect’s Housing in Trenton — that is still in use today. The University itself has been a major sponsor of architectural commissions. Noteworthy mentions include Marcel Breur, Frank Gehry, Gwathmy Siegel & Associates, Machado & Silvetti, IM Pei, Robert M Stern, Robert Venturi Scott Brown, and Raphael Vinoly & Associates to name a few. We pass by many of these buildings daily yet we probably never take time to reflect how they have changed our landscape in significant ways. Design has become more important (although unnoticed) with the advances of technology. It is our hope that this exhibit stimulates discussion and other exhibits that continue to highlight the design-rich aspects of our community. To read the Ilene Dube review in US 1, click here.